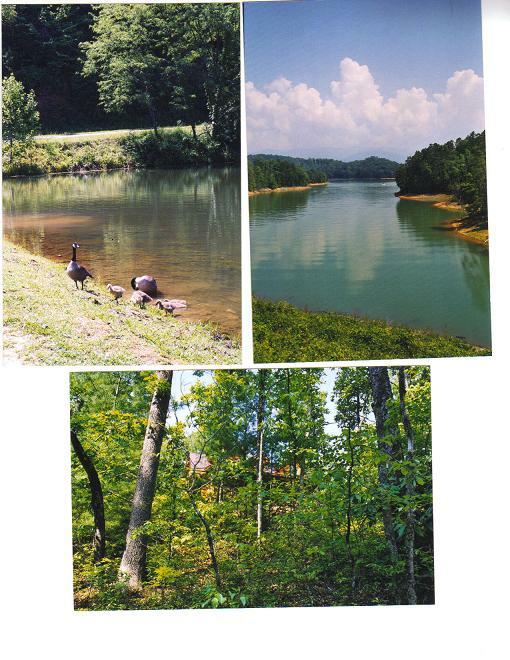 Brockett's Cabins in the Smoky Mountains w/private Lake for fishing & swimming. Fish in our private community Lake no licence required...there are big and small mouth bass, pike, brim, & croppies....use the small paddle boat to get out in the middle of the lake....bring your fishing gear & life jackets for the choldren 18 and under. 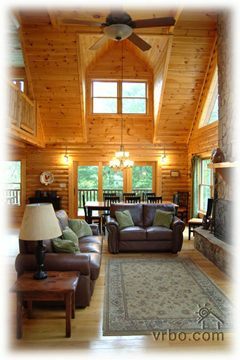 Brockett cabins is your home away from home! 20 minutes to Bryson City located on a mountain with lake. 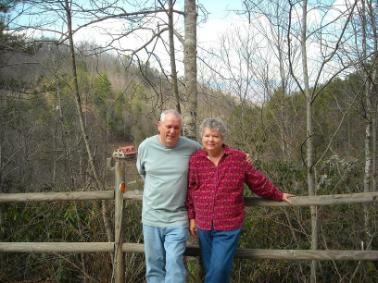 My name is Sandi Brockett, I represent and manage 9 cabins/chalets in Tobacco Branch Village, a private well-maintained beautiful mountain community in the Smoky Mountains... 20 minutes away from Bryson City, NC. ay..We are able to offer 10% off these adventures . We also are only 5 minutes to Tsali mtn. biking, & approx 1/2 hour to Cherokee Indian Reservation and Casino, Joyce Kilmer Forest, Cades Cove and Smoky Mtn Railroad train. We have been members of the Bryson City Chamber of Commerce for over 16 years, feel free to call the chamber at 1- 800-867-9246 ask for the Mgr.Karen Wilmot. covered deck and the hot tub has a gazebo. There are leather chairs in the reading room that massage your sore muscles. 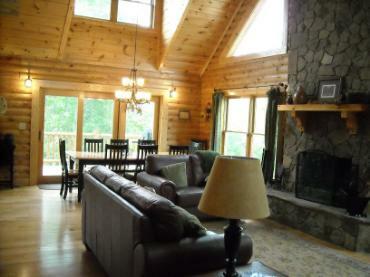 Enjoy luxurious Smoky Mountain vacationing at Engelzar cabin! 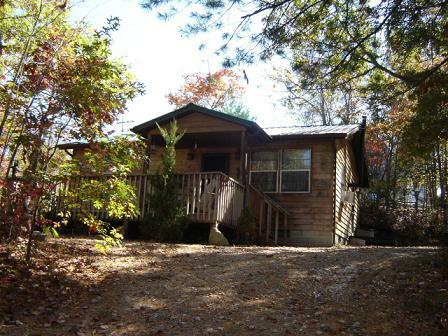 Our cabin is perfect for family vacations or a weekend getaway. Whether you enjoy outdoor adventures, fishing, golfing, shopping, or curling up with a book. There is something for everyone. 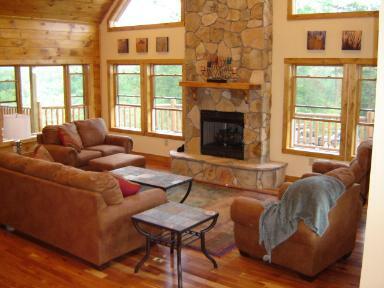 Engelzar cabin is a 5 bedroom, 3 bath luxury log cabin. 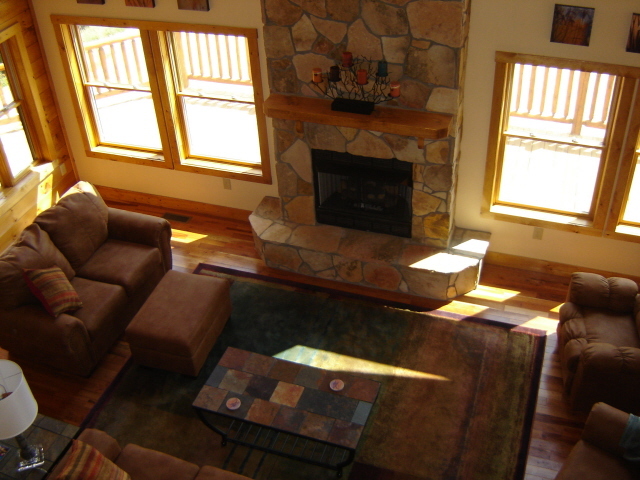 Located in the quiet community of Tabacco Branch, minutes from Lake Fontana, Tsali Trails, Nantahala River, Bryson City and the Great Smoky Mountain Railroad. Our 3100 sf cabin has a beautiful covered front porch with rockers and large newly covered back deck perfect for grilling and enjoying the scenery. 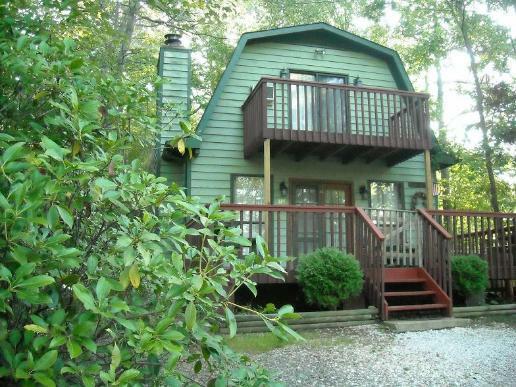 Additional conveniences are: DIRECTTV, WIRELESS INTERNET ACCESS, AND THE SECLUDED HOT TUB UNDER THE BEAUTIFUL GAZEBO. The main floor includes a great room with wood burning fireplace, dining room with table that seats 10, fully equipped kitchen and breakfast bar, laundry room, full bath, and master bedroom with a queen size bed. Upstairs you will find a loft reading area with two massage recliners, two bedrooms (1 - queen size bed, 1- full/twin bunk with twin trundle, and a full bathroom. Our basement includes family room/game room with pool table, air hockey table, big screen TV and PlayStation 2. 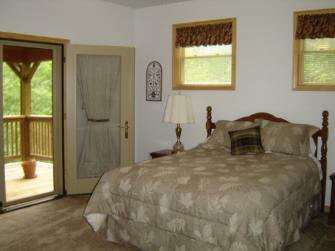 You will also find two bedrooms with queens size beds and a full bathroom. 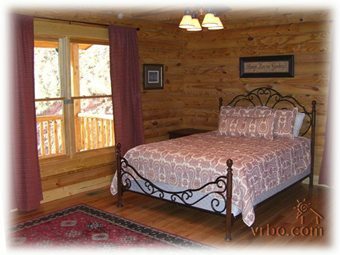 Our home will sleep up to 12 guests. 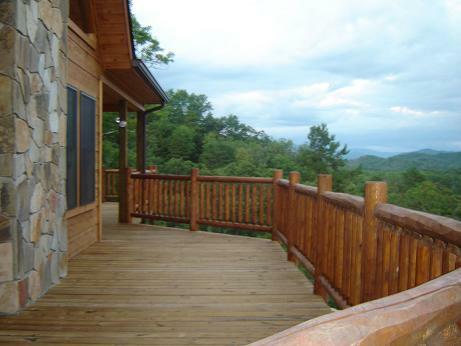 Deer Ridge 5 Br./32.5bath, hot tub, wifi, direct tv 3500sq ft.
brand new luxury home perched on its own mountain top in the heart of the Great Smokey Mountain National Park. This new 3,500 square foot, 3-story home is bright and airy, with spectacular views from every room, huge beds, dining and living rooms, modern kitchen, hardwood cherry floors, & a Foosball table! Wood swing and rocking chairs on 1,800 sq ft of decks. 90 mins to Asheville, 3.5 hour drive to Atlanta airports. The Appalachian Trail crosses a couple miles up the road. Fully private up here. A stairway behind the home leading up to several miles of pristine hiking trails. A short hike downslope leads to a common area which includes a small lake with a floating dock to fish or swim. There's also a football sized grass field with pavilion, horseshoes, and shuffle board. Perfect for a day out with the family. Three alpine lakes, two white water rivers nearb ay! Amish & Railroad. His queen bed is a Goldilocks delight very comfy. The room with the twin beds is Beary Bears! has a picknic table area and a firepit for marshmellows & hotdogs. 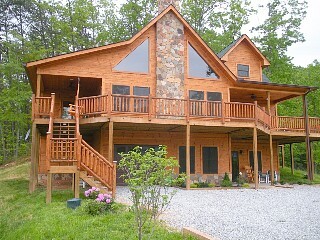 sits upon a top of a mtn.3800 feet high.She is surrounded by Mtn Views and is nestled in the forest. You will see how God paints a diferent picture each morning and night. Wind whispers as the Trees talk.. She has two bedrooms upstairs with queen beds. 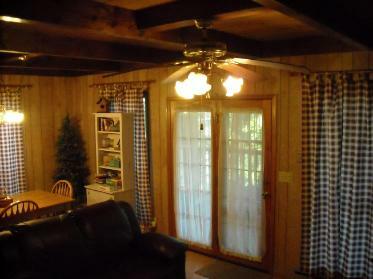 decorated with country cottage & plaids pink. 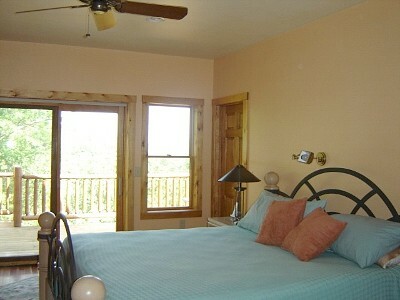 The Second room upstairs..Blues & Amish... it also has a romantic deck. A full bath upstairs in roses & Ann Geddes bath babies. There is a private lake below spring fed that you may swim and Fish at. Bring your bathing suits. Downstairs twin beds decorated in whimiscal froggies. A full Sunflower bath downstairs, leads out to the romantic hottub and sitting deck. The kitchen is fully equipped including a Mtn. view while preparing dinner. The livingroom is compy and decorated country Amish. Both decks afford enjoyable mtn. views & seclusion.